51 Jesus went down to Nazareth with them and was obedient to them. His mother cherished every word in her heart. 52 Jesus matured in wisdom and years, and in favor with God and with people. (Luke 2:41-52 Common English Bible). Jesus is an enigma. Although Matthew and Luke offer us visions of Jesus' birth, the gospels tell us little about his upbringing. Life starts in Bethlehem, but before long moves to Nazareth. There have been many attempts to fill in the gap between the day of the return to Nazareth and the beginning of Jesus' ministry at his baptism by John decades later. There are a number of infancy gospels that seem to come from Gnostic sources that offer us a miracle working adolescent such as forming a clay bird and then breathing life into it -- a story that is picked up by the Qur'an. The one story that finds its way in the Gospels is that of a twelve year old boy visiting Jerusalem during Passover with his family. Luke suggests that the family made this pilgrimage annually, and on this occasion, Jesus gets separated from his family. They even head home, apparently assuming that Jesus is with the caravan heading north. It's not until later that they discover his absence, and they return to Jerusalem to look for him. It's hard for us, as moderns, to think that parents might leave behind their child, but Luke doesn't seem to think this is far-fetched. 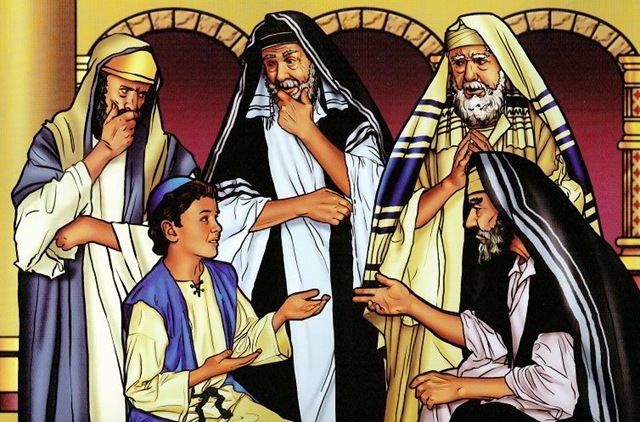 After three days of searching, they find him in the Temple -- engaging in conversation with the religious leaders and scholars, who seem amazed at his wisdom and understanding. In essence this twelve-years-old boy becomes the teacher and they the learners. The key to the passage is Jesus' response to his parents. Taken strictly -- according to Jewish law -- Jesus' response didn't show respect or honor for his parents. After all, why wouldn't they be looking for him. He sounds almost arrogant in his response to their statements of concern for his welfare. But Luke is making a statement. His youthful Jesus doesn't make clay pigeons fly, but he is engaging in prophetic work. Jesus says to his parents -- "Didn't you know that it was necessary for me to be in my Father's house?" He wasn't talking of Joseph, but of God. He had heard the call -- God had put in a claim, and Jesus answered in the affirmative. He does return home, takes up where he left off, and continues to mature -- in wisdom and stature (CEB -- years). He finds favor with both God and neighbor. We're left wondering -- what kind of child was he? What was his own sense of awareness. Did he, as Luke suggests, seem to understand, even if his parents struggled with it, that his was a unique calling and gift? Did he see himself less as the son of Joseph and more the son of God? Although we don't know what kind of education he received, can we not imagine his grades? As someone who has struggled with math -- I wonder, did Jesus have to study, or did he already know it all? Such are the questions posed to us by this lection!